Here at Subaru of San Bernardino near Riverside, CA, we want everyone to enjoy the benefits of a vehicle that is in good repair so we employ some of the best factory trained technicians in the business. Whether you have had enough of a power window that doesn't work right or it is about time to have your clutch replaced, you can count on quality parts and expert labor in our Service Department. We frequently update our specials to provide you with more and we work hard to make sure your visit is as convenient as possible. When it comes to keeping your vehicle in good repair both inside and out, head just east of Fontana, CA and come see us at Subaru of San Bernardino. Not all auto shops are the same and finding the right mechanic to trust can be a real gamble. That's why the factory trained technicians in the Subaru of San Bernardino Service Department serving Rancho Cucamonga, CA go the extra mile and take pride in their work. We want to be the service department you trust and tell your friends about so bring your Subaru by and know that it will be cared for with genuine Subaru parts and accessories, just like those available in our well-stocked Parts Department. Check back with us often for updated parts specials and take a minute to browse our huge selection of new Subaru models next to Colton, CA. You will always find great deals and we even stock a variety of certified pre-owned Subaru models. In fact, we want to be your go-to whenever you need a vehicle so we also stock a large inventory of quality used vehicles near Redlands, CA. No need to put off that repair any longer, give us a call at (877) 790-7215 and schedule a service appointment or simply cruise by and see us at 645 Auto Center Dr, San Bernardino, CA 92408. 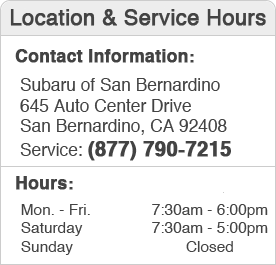 We look forward to meeting you at Subaru of San Bernardino.